AMD's latest drivers include Project ReSX improvements. AMD has just released a new graphics driver which is notable for, not just the new AAA games supported, but the inclusion of Project ReSX (PDF) code improvements. In brief, ReSX is short for 'Radeon eSports eXperience' optimisation code. With this code in place, and thanks to collaboration with the makers of important eSports titles, AMD has some pretty impressive claims for improvements in fps, fluidity, and responsiveness in titles such as PUBG, Overwatch and Dota2. The latest driver release, as HEXUS was notified by AMD this morning, is Radeon Software Adrenalin Edition 18.3.1. You can check over the standard release notes here. You will see that the official highlights for this driver are; the support for Final Fantasy XV, support for Warhammer: Vermintide II, and speed-ups in Dota2. There are also fixed issues in Radeon Chill hotkeys, Sea of Thieves, Middle-earth: Shadow of War, and World of Tanks. The introduction of ReSX optimisations is hinted at within the Dota2 performance information in the driver release notes. 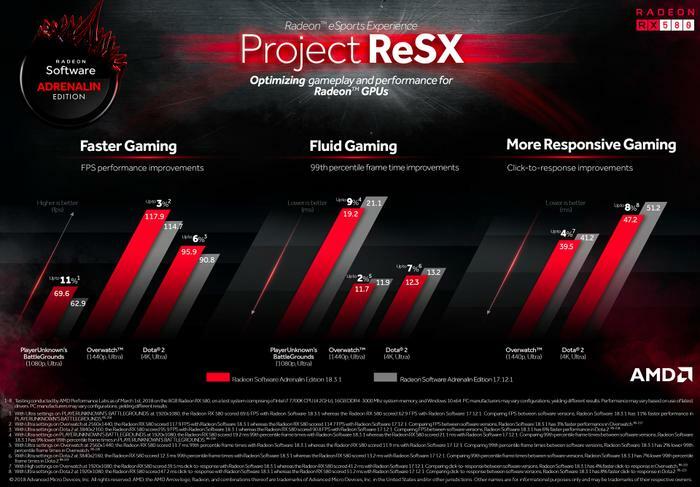 In that example, and as shown the chart below, AMD comparatively tested Radeon Software 17.12.1 with the new 18.3.1 and, thanks to ReSX, is seen to be providing its users some worthwhile performance improvements in eSports. PCPer has some further info on ReSX which it says will not just boost the in-game fps, but improve fluidity and responsiveness in a raft of important eSports titles such as; PUBG, Overwatch, Counter-Strike: GO, League of Legends, and Dota2 etc. It looks like the newest RSCE offers ReSX tweaks for Dota2, and for others it will be "rolling into games in the coming weeks." 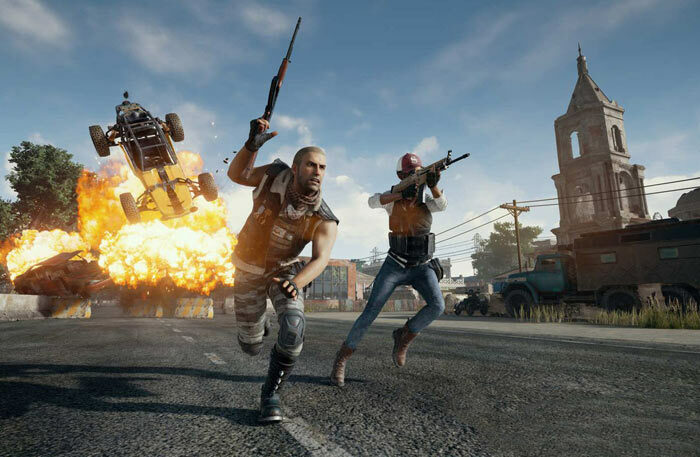 Considering the specific data presented by AMD's eSports chart, PUBG, for example, enjoys a frame rate boost for 11 per cent, plus a 9 per cent improvement in the 99th percentile frame time, said to be an indicator of smoothness. Dota2 players will be pleased with more than faster fps too; AMD claims that the 'click to response' measurement in this game was as much as 8 per cent faster. AMD's test GPU of choice was the Radeon RX 580 but even better improvements could be possible with Radeon Vega cards, hinted AMD's Scott Wasson. Meanwhile Nvidia doesn't sit idly by, of course. Its own Final Fantasy XV and Warhammer: Vermintide 2 supporting driver (v 391.01) includes optimisations for the PUBG experience. A table published by the green team shows fps improvements ranging from 3 to 7 per cent in PUBG across GTX10 series graphics cards over a range of resolutions. Nvidia says that "In addition to delivering the best day-1 experiences possible in the latest releases, our Game Ready driver program continues to optimize and improve the games you care about long after their launch." It also appears that this is NOT for use with the RR based APU's…. I love abbreviations. Depending on your primary technical lingo they can make for entertaining, nonsensical reading. On first pass I read that as “It also appears that this is NOT for use with the rate response based auxiliary power units”. Probably makes as much sense to be fair on re-reading. They really should (IMO) also put work toward the more Esports based card that being the x50 and x60 lines i.e RX 450/460 or 550/560 fine tune the performance on these and more easily able to capture the much more amount of shaders etc that the larger cards have…and while they are at it, figure out a way to “tune” the power use profiles for ALL the cards in their portfolio, that is when certain parts of the card are not being used, they should not maintain a full power on status, horsepower is always a good thing to have, but, if that horsepower is being used to keep a very wide fuel pump open for it to only use 1/3 to 1/2 of what it can do, that power is wasted for nothing gained.